﻿This is a sponsored post written by me on behalf of Char-Broil for IZEA. All opinions are 100% mine. Memorial Day is just around the corner. It's a day to remember our veterans. It's also one of my favorite holidays because it usually means opening our pool, relaxing, and gathering with family and friends for a BBQ. Some of the happiest memories I have as a child are getting the family together and my dad grilling up hamburgers. The picture above is a photo of my sister and I before a family BBQ. So, before summer officially begins you should make sure you're prepared to entertain with the new charcoal Char-Broil Kettleman Grill! More than 65 years ago, Char-Broil brought the first charcoal grill to market. In the years since, the company has introduced a series of innovations that are now standard among modern grills, always striving to make cookouts more enjoyable for the millions of people who barbecue each week. The latest breakthrough is Char-Broil’s new Kettleman 22.5” Charcoal Grill (MSRP $139), an updated and vastly improved kettle-style grill that is more efficient and easier to use. The Kettleman also has a hinged, latching lid that never has to touch the ground during the grilling experience and makes moving the grill a breeze. Temperature Control – With a super sized cool-touch damper on the grill’s lid, heat management is easy. Vents around the body of the kettle allow air to fuel the fire from all sides, providing even heat to the cooking surface. Flare-Up Control – A porcelain coated no-fall-through grate allows charcoal flavor through while keeping flames away from food. Wood chips can be thrown on the grate and small foods like shrimp or asparagus will never fall into the fire. 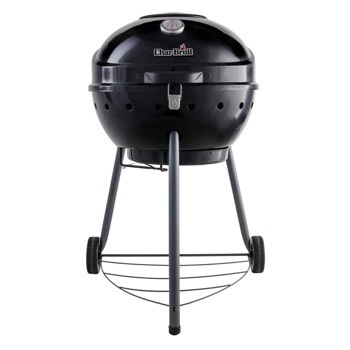 Charcoal Control – Designed to grill twice as many burgers with the same 50 briquettes as the leading kettle. Ash Control – A slide-in, porcelain-coated ashtray is tight against the grill making cleanup and maintenance simpler than ever. Stability Control – Wide stance, heavy-gauge steel legs add stability and easy mobility. A bottom shelf doubles as a holder for the cooking grate or other accessories. My family had a charcoal grill when I was a child. There is nothing like the taste of a perfectly cooked hamburger from a charcoal grill. The flavor is more smoky and savory when cooked over charcoal. To get ready for the grilling season go to your local Lowe's or online at www.charbroil.com to learn more about the Kettleman grill. 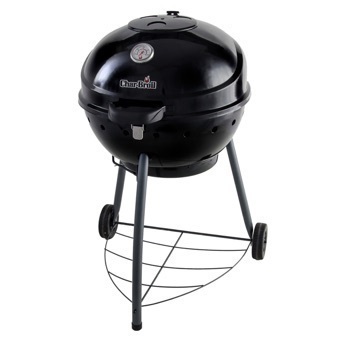 At only $139 you can't beat this awesome price for all the great features that will make charcoal grilling easier. I'm not handy with a grill, but the Char-Broil Kettleman Grill makes it a breeze to control the temperature, limit flare-ups, and clean up.